Is your house ready to fall? Your house is being threatened. 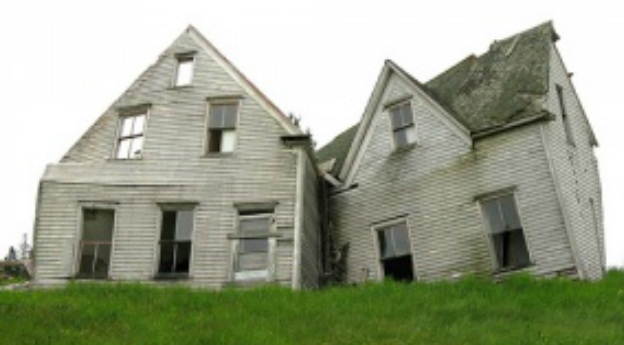 while the above picture is certainly an exaggeration of what forces a house can be subjected to, it is also a clear indication of some things to pay attention to for your home's regular maintenance. Your yard can only soak up so much water. Heavy rains or excessive watering can intensify this problem. The grade or slope of your yard should push any additional surface water away from your home. Leaves, sticks and other debris can easily clog up your gutters and downspouts. 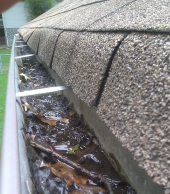 Clogged, improperly sized and poorly sloped gutters and downspouts can lead to many serious problems. When watering your plants try to keep the water away from the siding and brick. Keep mulch at least 8 inches below the first layer of siding or brick. Make sure that any water leaving your house daylights at least 4 to 6 feet away from your foundation.